Synopsis: In the city of Agora, anything can be bought and sold. Even children are possessions until their twelfth birthday. Mark has been sold by his father, and Lily, an orphan from birth, has bartered for her life. Thrown together by chance, in the ancient tower of Count Stelli, they face an existence of poverty and servitude, unless they can find a way to break free. But, unbeknown to Mark and Lily, they are being watched by the ruler of the city. Can they survive the traps and treachery that await them and discover the dark secret that binds them together? Their lives depend on this question: what is the Midnight Charter? With The Midnight Charter, David Whitley has created an unexpected and beautiful tale of friendship, love, forgiveness and reconciliation. It has a powerful message, something I really had not expected before starting the Midnight Charter. Reading the blurb, it just sounds like a mediocre fantasy, and I cannot emphasise enough how untrue this is. This is one of the only fantasies I have read that made me think. A few of you may have read some of William Nicholson’s fantasy novels; I hold them in great esteem. I can honestly say that the Midnight Charter is even better. For a start, the characterisation is wonderful. There is a multitude if characters, and none of them are dull. Lily is kind, patient and moral; Mark does what he thinks is right. Then there’s Laud, Stelli, Theo, Gloria…. David Whitley has put a tremendous effort into creating the characters, and it really has paid off. The way the characters develop throughout the novel is commendable, and I have not read a novel in a long while that seems to be so honest with the characters. The world building is also fantastic. Right from the start, there is a feel for the richness of Agora. The Victorian-come-Renaissance setting really works with what David Whitley has created. Agora seemed like such a realistic place, and the whole book felt like a history of the world rather than a work of fiction. There are not many fantasy stories that can suspend disbelief so very well, but this is one of the few I have read that do. All those pale in comparison against what I would call its greatest asset, however. That asset is the heartfelt themes this book portrays: the search for truth, forgiveness and reconciliation, heartbreak, love and doing what is right. Never before have I read a book that can pin these themes down so well and present them in such an honest and beautiful way. The Midnight Charter displays so many concepts that today’s world forgets more and more, and to see these in a novel is heartwarming and reminds how wonderful these things really are. David Whitley’s writing style is also flawless: it flowed nicely, and manages to describe things in a light manner; you would hardly realise while reading that it was description, and yet it describes very well. The dialogue is also largely impeccable; it reads realistically, and portrays the characters well. 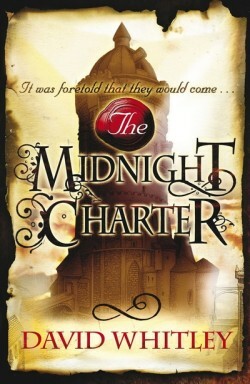 In all honesty, I wasn’t in a rush to read The Midnight Charter after reading the blurb. When I actually started, I was utterly engrossed, and I couldn’t have been more wrong. This is very far from the mass of derivative fantasy we are exposed to, and it is beautifully written. The Midnight Charter is officially one of my favourite books so far, for its honest and realistic characters, its wonderfully described setting and its fantastic portrayal of moral themes and concepts. What did you think about The Midnight Charter?